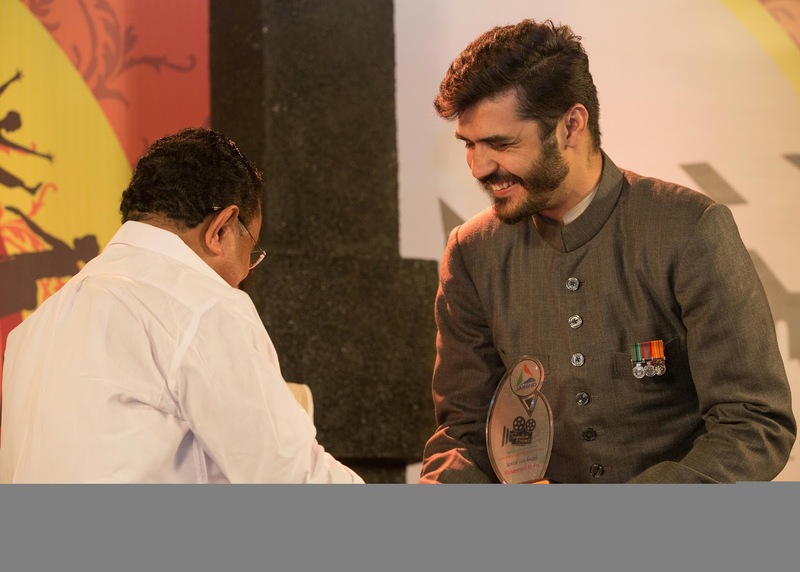 AMUNetwork.com/ News from AMU /Aligarh Muslim University: Naseer Uddin Shah's nephew, Major Mohommed Ali Shah has been winning laurels at various International Film festivals for his outstanding performance as an actor. Naseer Uddin Shah's nephew, Major Mohommed Ali Shah has been winning laurels at various International Film festivals for his outstanding performance as an actor. ACTOR ALI AND HIS GOLDEN KING MIDAS TOUCH : After winning the coveted " Best Actor" award at one of ASIA's largest film festival, The Prestigious Delhi International Film Festival in Dec 2015, where films that were going to the highly coveted Oscar's and cannes were also screened and having bagged 2 highly coveted awards at the International Film festival of Prayag" in Feb 2016, apart from Best Actor" at the Aligarh International Film Festival FILM SAAZ in March 2016, Major Mohommed Ali Shah bags another prestigious accolade as " Jury and critique's Best actor" at the prestigious Malayalam TV Channel " Jai Hind TV" film festival on 08th Aug 16. he acted in Vishal Bhardwaj's cult film - " Haider" and Haider won 5 National awards apart from umteen filmfare awards apart from various International awards at various International platforms. Seems like this great actor nephew of one of the greatest actor's certainly has the " MIDAS TOUCH" ( Whereever he is involved, the project is bound to do exceedinglywell), where ever he has acted or which ever film festival he has sent his film's entry into - he has emerged with laurels. We can infer that this promising young actor is a GUARANTEE for any film winning prestigious awards at International level. That is the least one can expect when an actor has been trained in acting by none other than his legendary uncle, Mr. Naseer Uddin Shah, has been working on his craft right from the time he was 5 years old and has had had one of the toughest training being an Ex Major Sahab from the Indian Army and to top it all been a topper from one of the top most Premiere B school's from the country, the prestigious IIM, Calcutta. One had herad the story of Kind Midas in childhood, where whatever he touched turned into gold - it is very similar in this case, Ali has become a guarantee for any film to yield awards. Ali has proved that he can carry off any role big or small and can carry the film entirely on his shoulders. The very talented and critically acclaimed actor, Major Mohommed Ali Shah who did a 5 year stint in the Indian Army and served in the most difficult areas of the country such as “ Jammu & Kashmir” and the “North East”, and was awarded a commendation card for his meritorious service to the Nation of being unmindful of his own personal safety and for going beyond the call of duty and had the rare honour of leading the “ Assam Rifles” marching contingent at Rajpath, New Delhi saluting H.E. The president of India, who had decided at the age of 5 itself that he wanted to become an actor eventually, who was also awarded one of the most coveted and major awards at one of the largest film festival's of Asia, that of " Best Actor" at one of the biggest International platform, after almost 2 months he was also awarded 2 major and coveted awards at the very Prestigious International Film Festival of Prayag when the Mini Kumbh mela at Allahabad was on in february, that of ' Best Actor" and a rare honour of a " Special mention by jury and critique's for outstanding performance", he was also judged as the " Best actor" at the prestigious Aligarh International Film Festival - Film Saaz, where the prestigious award was given by acclaimed director Nishikant Kamat who directed award winning and critically acclaimed films like Drishyam and Madaari, which were a super success recently, has got into the habit of winning laurels and being recognised for his talent and good work. Once again at the prestigious Malayalam TV " Jai hind TV channel", he was recognised for his talent and was awarded a Major and the most coveted award of “Jury and Critique's Best Actor”. Interestingly it is a less known fact that Shah was to act in Major Ravi's latest film '"PICKET 49" with Malayalam superstar PRITHVI. Since both Major Ravi and Major Shah are both decorated Ex army men, it would have brought a lot of authenticity to the film. However, due to Shah's commitments for Vishal Bhardwaj's - " Haider" he couldn't be a part of the film. The two are still in talks of working sometime in the future though. Incidentally, Major Sajeev Kevyi who made the critically and highly awarded film " The Ruffian", too is an Ex army officer, an EX NSG COMMANDO, who also studied management at IIM, who too left a flying career to pursue his passion for film making. The English film ( dubbed into Malayam and hindi) he acted in " The Ruffian", where he played the title and the lead role- Gave a Tour de performance as an actor. Ali has done professional Theatre and trained as an actor under the able guidance of Thespians such as his father’s younger brother, Mr. Naseer Uddin Shah and Mr. Tom Alter, having such mentors who are a great institution in itself, there is nothing to stop Ali in climbing the greatest height. He had a very important role to play in Vishal Bhardwaj’s latest film – “ Haider”, which won 5 National awards apart from numerous Filmfare and International film awards. He has just completed shooting for National School of Drama alumnus and National award winning director ( for “ Paan Singh Tomar”), Tigmanshu Dhulia’s latest film – “ Yaara”, where he ages in the film from young to old, Legendary South Indian actor Kamal Hassan's daughter Shruti Hassan, Vidyut Jamwal, Amit Saad and Sanjay Mishra are starring in “ Yaara”. It is a role which is very challenging and demanded a whole lot of dedication, discipline, devotion and commitment and took Ali a year to prepare for it. Ali made a humble begining in Sriram Raghavan’s, Saif Ali Khan and Kareena Kapoor starrer – “ Agent Vinod”. Ali studied business management from the very prestigious, IIM Calcutta and has had the honour to have worked with some leading multinational companies such as “ Genpact”, “ Rolta Thales Ltd” and “ Mahindra & Mahindra Ltd” at a very senior position and believed in his abilities as an actor that he gave up his cushy, comfortable regular 9 to 5 job to pursue his childhood passion and fascination for acting. He is the son of Lt. Gen. Zameer Uddin Shah ( PVSM, SM, VSM) former Deputy Chief of The Army Staff, former member Armed Forces Tribunal, currently the Vice Chancellor of the prestigious Aligarh Muslim University. His wife is doing her PHD from Jawaharlal Nehru University. Despite hailing from such an illustrious background Ali wants to create his own identity on his own and doesn’t believe in living in the shadows of his illustrious father and uncle. Ali has worked very closely with the “ Film and Television Institute of Pune” as well the “ Symbiosis Institute of Mass Communication”, Pune apart from being crowned the coveted title of Mr. Pune “ Talent” in 1999, while persuing his graduation from “ Fergusson College”, Pune. A whole lot of selected films were screened at the Prestigious Malayalalam TV channel's film festival. English film dubbed into Malayalam and Hindi “ The Ruffian”. The Jury panel was highly impressed by Ali's acting skills and abilities, that it was undoubtedly a unanimous decision to select Shah for the highly coveted award. Interestingly exactly 20 years ago Ali had won his first award as the “ Best Actor” for one act plays competion at his school “ Lawrence School, Lovedale” .This is the 8th award shah received on an International platform in just a short span of 7 months. Major Mohommed Ali Shah is a huge inspiration to many who want to convert their dreams into reality. Let us learn from such versatile people like him how one listens to his heart and mind and lives his life on his own terms like a daredevil. Seems like Ali is in a habit of being an achiever and that habit has now taken him to an International level. The Nation should feel proud of having citizens like him. If Major Shah continues his hardwork at this pace, we are sure of him going even ahead of his illustrious uncle, Mr. Naseer Uddin Shah and let's hope for a National Award for Ali for his next Major film " YAARA" - Ali has prooved that where ever he is involved, success is bound to follow. At this pace an Oscar for his talent is not too far from him.